From weight to height – from energy consumption to BMI. From the first time a user weighs and measures with the seca 285, he will be pleased with the three-line field in the multi-function touch display. Its operation is intuitive and its white backlit display is easy to read in any light. 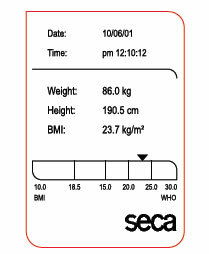 At a glance the user can see weight, height and the automatically calculated BMI. When the parameters gender, age and PAL (Physical Activity Level) are entered via the input key, the scale can determine resting metabolic rate and total energy consumption and, with the help of the 360° wireless printer, generate a print-out. Likewise with percentiles for children, which the print-out compares to standard values. 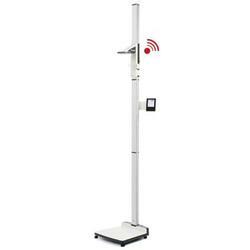 Paperless and error-free wireless transmission of measurements. With the seca 360° wireless technology the seca 285 can wirelessly transmit results to the optional seca 360° wireless printer. With network-capable software seca analytics 105 and the wireless adapter seca 456, measurements can be received by your PC, analyzed and made available to an existing Electronic Medical Record (EMR) system. So the seca 285 is EMR-integrated and ready for electronic medical records and all the requirements the future brings with it.